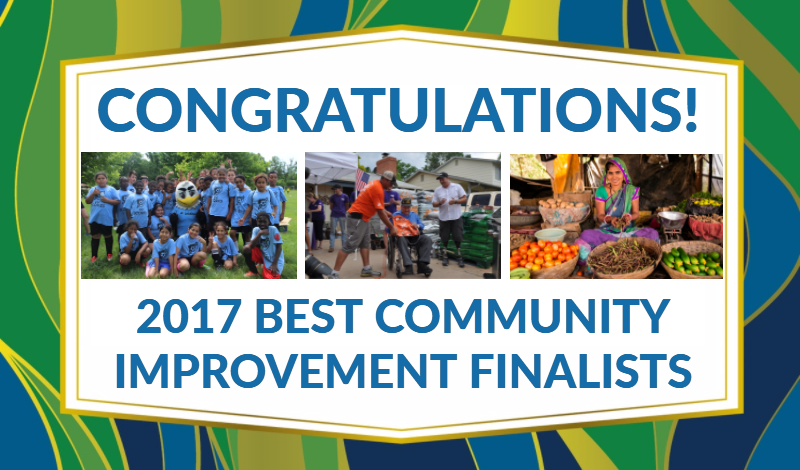 Congratulations to the 2017 Best Community Improvement Finalists! Learn more about their programs and join us at the 2017 Corporate Citizenship Conference and Awards on November 14—15 to see who wins! Nearly 20,000 low-income Washington, D.C. schoolchildren are left alone or unsupervised once classes end each school day. Seventy-five percent of these kids are academically below grade level. Additionally, D.C. lacks organized sports leagues at schools, and many families cannot afford pay-to-play leagues. As the city’s major league soccer team, D.C. United partnered with the nonprofit DC SCORES to provide a free after-school soccer and literacy program. Since its launch, this partnership has provided 2,500 low-income children in D.C. with a safe place for physical activity and academic development. The program has had a tremendous impact on the children’s physical health as well as level of school engagement. Eighty-one percent of participants improve their cardiovascular endurance in one year, and 100% are confident they will graduate high school. Falling is the leading cause of injuries in Americans over the age of 65—many of whom are also veterans. In partnership with Meals on Wheels America, The Home Depot Foundation implemented the Helping Homebound Heroes program to address this issue. This collaboration aligns the meal delivery service Meals on Wheels provides homebound veterans, and The Home Depot Foundation’s commitment to improving the lives of veterans in its communities. Helping Homebound Heroes ensures senior veterans have a safe home and can remain independent for as long as possible. In three years, this partnership has repaired the hearts and homes of more than 300 senior veterans. It’s also enabled Home Depot associates to see firsthand the gratitude and results of supporting these veterans. Smallholder farmers account for 80% of the food produced in emerging markets. The John Deere Foundation partnered with PYXERA Global to develop the Joint Initiative for Village Advancement (JIVA) to create a deep and lasting impact on three villages in Rajasthan, India. JIVA’s approach to economic empowerment is guided by John Deere’s belief that farmers are some of the world’s most gifted entrepreneurs, capable of making the best decisions for themselves. JIVA was co-designed with the communities in Rajasthan to ensure long-term program success and sustainability. The initiative focused on bolstering agricultural productivity and resiliency while improving public education. Since its launch, increased yields in staple crops have increased the average income of farmers by 7.1%. JIVA’s investments in education have ensured that more children are learning; in fact, 10th grade examination passing rates have increased from 30% to over 80%.